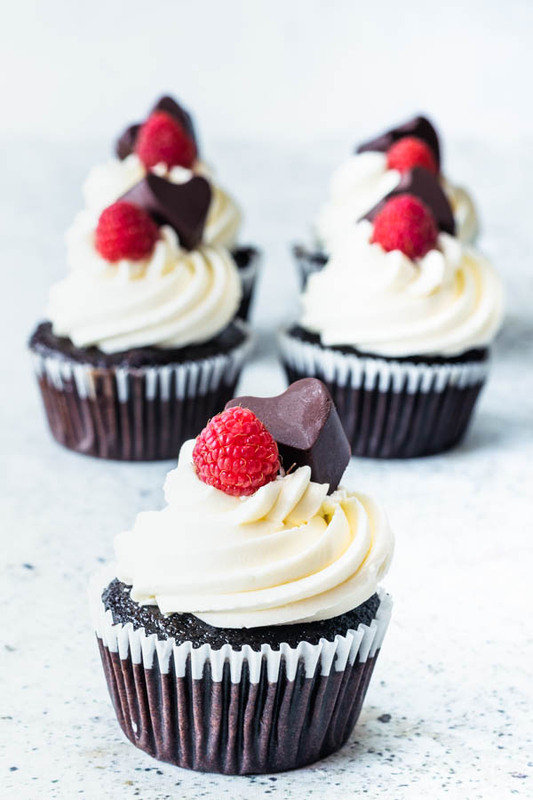 White and Dark Chocolate Raspberry Cupcakes. These are my Raspberry Love Triangle Cupcakes. When the Raspberry couldn’t choose between white or dark chocolate! Raspberry, you and I have that in common. Sometimes I just can’t choose. So both it is! This is a super special post because a few of us food bloggers got together for a greater cause. And that cause is #CupcakeMondays! Check out below at the end of the post, the other delicious and beautiful cupcakes my friends brought to the #CupcakeMondays party. Also, check out our awesome Giveaway!! Yay! And there are some cool prices involved too! 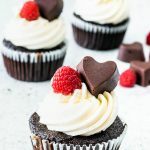 Scroll down below to read more, right after I am done rambling about why these are the best raspberry cupcakes I’ve ever made! So, these are the BEST raspberry cupcakes I’ve ever made. 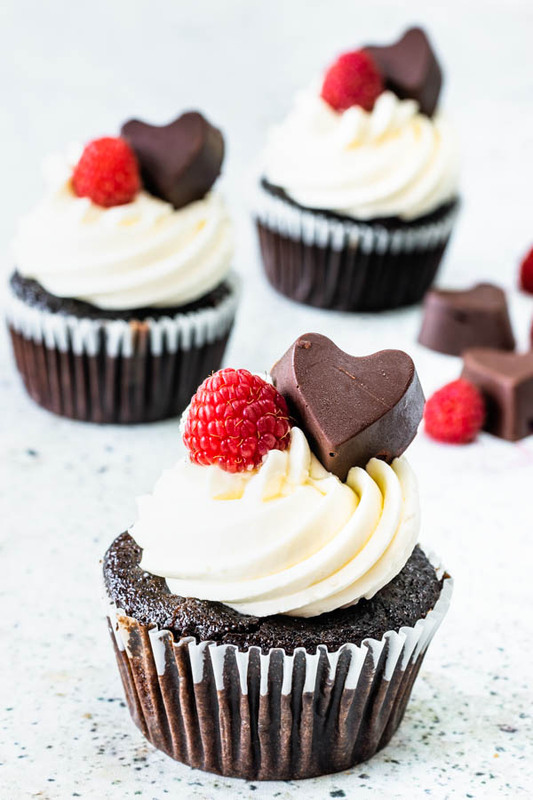 In these White and Dark Chocolate Raspberry Cupcakes, we have dark, rich chocolate cupcakes, filled with a raspberry jam filling. Then, I topped the cupcakes with White Chocolate Swiss Meringue Buttercream. Finally, I placed these cute chocolate hearts I made on top of the frosting. These homemade chocolates are made with dark chocolate, and filled with raspberry jam. And they were addicting! I made extra, for snacking! It may even be considered a healthy snack, since it was made with dark chocolate, and for the raspberry filling, I’ve used just a bit of maple syrup to make it sweet, that’s it. If you would like instructions on how to make the chocolates, you can check out a bunch of tips also on my post about these Peanut Butter Cups. For the jam, I used a bit of maple syrup, a squeeze of lime (you could use lemon, or just skip it), cornstarch, and plenty of freshly picked raspberries. It’s not such a sweet jam, since I like my jam to be on the tart side, so go ahead and add more sweetener to the jam according to your liking. What made the jam extra delicious were the freshly picked berries. 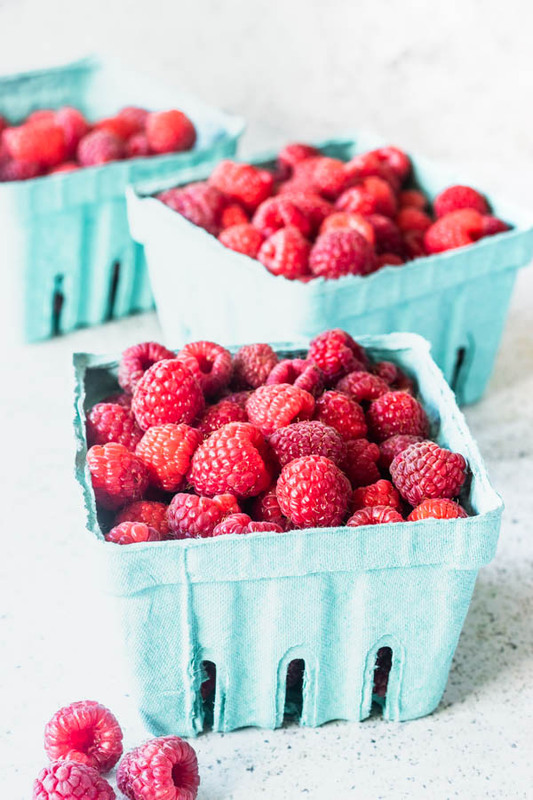 Freshly picked raspberries are beautiful, and seem more flavorful and sweet than the ones we get at the grocery store. It’s summer time, which means it’s berry picking season over here in upstate NY. My fam and I love berry picking! We have awesome places around the corner from us to go berry picking. We look forward to it all year! Anyway, I decided that those beautiful raspberries we picked would look great on top of fancy cupcakes. All I have to say about these cupcakes is that they were sublime! From the jam filled sponge to the chocolate on top. Everything was magical! The White Chocolate Swiss Meringue Buttercream is pretty much my favorite frosting ever (at the moment!) I have also used it recently on my White Chocolate Lime Cupcakes. I am seriously in love with these cupcakes and I hope you like them too! If you ever have any suggestions of cupcakes for me, just let me know. 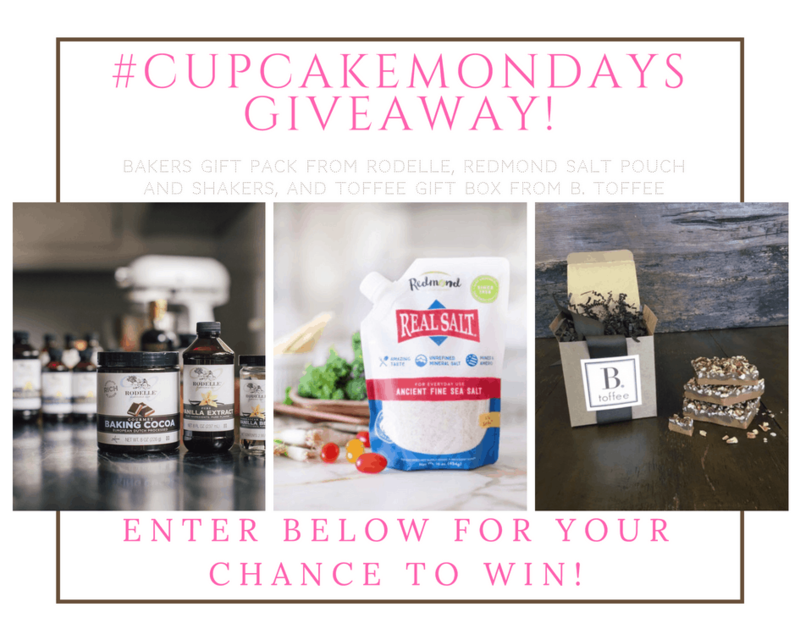 I am always looking for ideas to keep #CupcakeMondays going up in here! 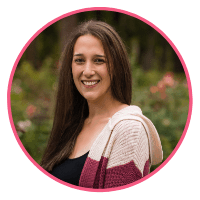 So, before I talk about the giveaway, I just want to say thank you for being here and reading my blog! I feel incredibly lucky to be a part of this community. I have truly found a place for my heart here! Check out some of my other #CupcakeMondays posts here. To continue the #CupcakeMondays party, be sure to check out the other cupcake recipes from my friends. You are in for a treat!! Thank you everyone! Good Luck! 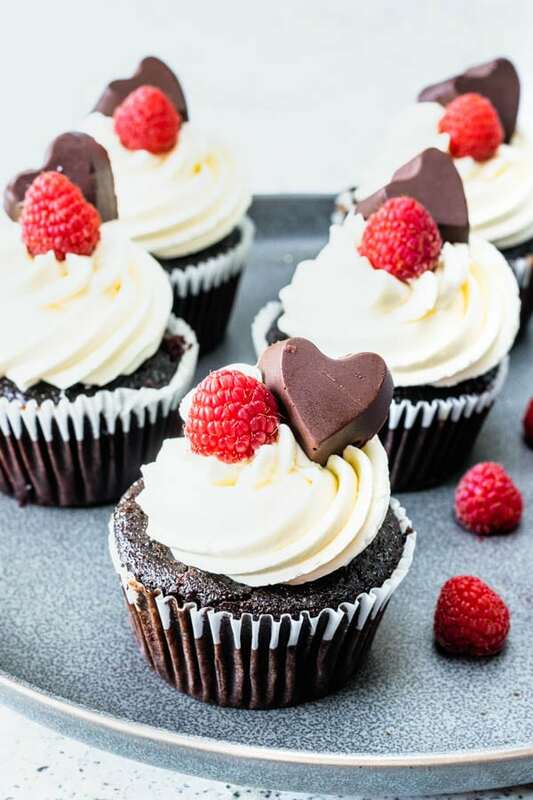 These White and Dark Chocolate Raspberry Cupcakes have a chocolate sponge, filled with raspberry jam. Topped with White Chocolate Swiss Meringue Buttercream, fresh raspberries, and homemade raspberry chocolate treats. 200 grams granulated sugar 1 cup 7 oz. 340 grams unsalted butter cold 1 1/2 cups, 12 oz. 340 grams dark good quality chocolate 11 oz. Pre-heat oven to 350F. Line a 12-cupcake pan with cupcake liners or grease it with butter and flour. Sift flour, cocoa powder, sugar, baking soda, baking powder, and salt together in a large bowl. In another bowl, mix coffee, vinegar, vanilla and oil. Pour dry mixture over wet ingredients. Whisk briefly, until incorporated. Be careful not to overmix. As soon as you see no more streaks of dry mixture, stop whisking. Distribute batter evenly in cupcake pan. Bake for 15-20 minutes. Remove and let it cool. Mix raspberries and maple syrup in a pan. In a small bowl, whisk the cornstarch with the lime juice. Set aside. Once raspberries come to a boil, reduce heat a bit, and keep stirring constantly. Slowly reduce the raspberry to a thicker sauce. Add the cornstarch/lime juice slurry. Mix and cook for a couple of minutes, until thickened. Remove to a heat proof container. Let it cool. Keep refrigerated until ready to use. Start by making the ganache. Bring the heave cream to just a boil in a small sauce pan. Pour it over chopped white chocolate. Let it sit for a bit, then stir with a spatula until chocolate has completely melted. Let white chocolate cool down completely. Place it in the fridge for 1 hour. About 30 minutes before you start to make your buttercream, remove butter from the fridge. Cut it into thin slices, about 1/4 inch thick. Set aside and let it come to room temperature. Depending on the temperature of your kitchen, you might need an hour or so to have the butter soften. Please note that you don’t want your butter to be too hot and melted either. Place egg whites and sugar in a heat-proof bowl or in a double boiler pan. Bring a pot of water to a boil, then reduce it to a simmer. Set bowl on top of the pan with simmering water. Whisk constantly until egg whites and sugar reach 138F temperature. This ensures that the egg whites will have reached a safe temperature. The temperature of pasteurized egg whites is actually 140F, however, if you bring it up to 138F, the temperature will raise a couple degrees even after you take it out of the heat source. Keep whisking mixture for about 30 seconds after you take it off the heat. Pour mixture into the bowl of a stand mixer. Be sure to wipe dry the bottom of the bowl to get rid of the condensation that formed before you transfer mixture. Because if a drop of water gets in contact with your egg white/sugar, it will ruin your meringue. With the whisk attachment, beat meringue on medium-high speed. You are going to beat the meringue until stiff peaks form. Now, this might take a while. Usually takes me about 10 minutes. The reason for that is that the egg whites have to cool down first and then they will be able to reach stiff peak. Just let the mixer do its job and cool down the meringue as it whisks it. Once your meringue has reached stiff peaks, start adding butter, with the mixer on medium-high speed. Add one slab of butter at a time. Waiting a few seconds before adding the next one. This should take you a while. Get there slowly. At times, you will question yourself if your meringue will ever form, the answer is mostly likely: yes it will form. Just be patient. Keep whisking it. Add vanilla once you’re done adding the butter. At this point, you should see your meringue having hardened up and formed into a smooth cream. Remove ganache from the fridge, beat it with the Swiss Meringue Buttercream, until incorporated. In case you have leftovers, or for future reference, this buttercream may be frozen for up to 2 months. Or keep it in the refrigerator for up to 5 days. You will need a chocolate silicon mold to do this. First, you have to temper the chocolate. It’s important that your chocolate is chopped small, to help it melt evenly and makes it easier to control the temperature. Place 2/3 of the chocolate in a double boiler, or over a pot with simmering water. Bring temperature of the chocolate in the double boiler up to 120F-122F. I usually remove the chocolate from the double boiler when I see it reaching 120F. Add the remaining 1/3 of the chopped chocolate. Stir until everything is melted. You are looking to cool the chocolate to 82F. Keep stirring until it reaches this temperature. Once the chocolate has reached 82F, you may place the bowl back in the double boiler over simmering water and stir until it reaches anywhere from 88F-90F. That will happen really fast. It will literally take seconds. Don’t overheat the chocolate. Once it reaches 90F, it’s in temper. To test, spread a thin amount of chocolate on a piece of parchment paper. If the chocolate dries shiny, it’s because it’s in temper. If not, you might have to re-temper the chocolate. To keep chocolate in temper, you need to keep it in this range of temperature. Keep stirring chocolate and try to move fast, or you might need to re-temper it. Start by scooping a small amount of tempered chocolate inside your chocolate molds. Spread it around with a spoon so it covers the entire surface of the mold. Place molds in the freezer for about 5 minutes. Remove from freezer. Spoon a small amount of jam filling in each mold. Pour some more tempered chocolate over jam filling. Scrape top with a spatula so the bottom of your cups is smooth. Place in freezer for another 10 minutes. Remove chocolates from molds. I like to store mine in the fridge. They will last in the fridge for a week or so, except that it never lasts that long in my house, for obvious reasons. Remove a bit of cake from the center of the cupcakes with the help of a small spoon. Spoon some cooled Jam filling in the cupcakes. Top with the cake you removed with the spoon. Pipe White Chocolate Swiss Meringue Buttercream on top. 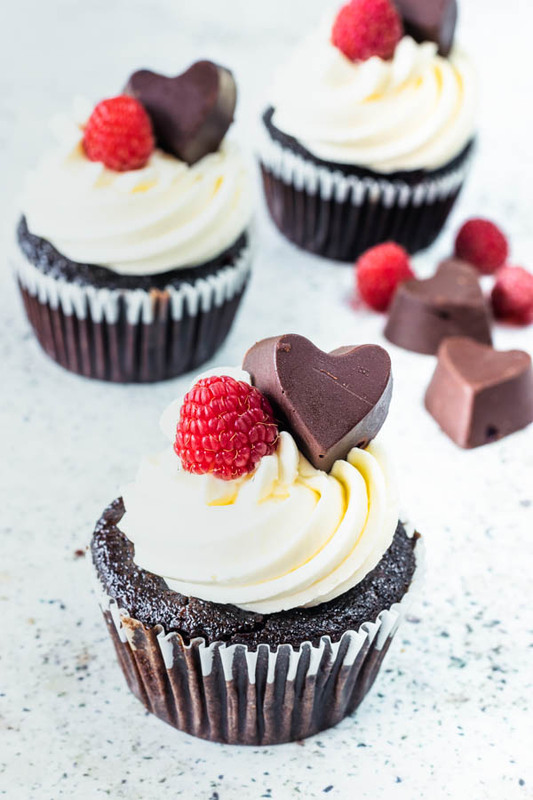 Decorate with raspberries and chocolate hearts! The farmers market is bursting with raspberries!! What a great way to put those to use. love love that we don’t have to choose between dark or white chocolate. These cupcakes are epic indeed! Thank you for having me be a part of your #CupcakeMondays special, Zainab! Loved your passionfruit cupcakes as well! I can’t get over how beautiful these are! I seriously am studying your pics because the light is always so pretty. And I love that these are a healthy snack :). That’s totally what I’m going to tell myself as a stuff two in my face! Thanks Kelsie, you’re so sweet. I love your pics as well. And loved your zucchini cupcakes!! They were awesome!! Delicious! I love the raspberry filling! These would be perfect for Valentine’s Day too with the way they are decorated! So tru, these raspberry cupcakes so could be Valentine’s Day cupcakes lol! Thanks Lauren! 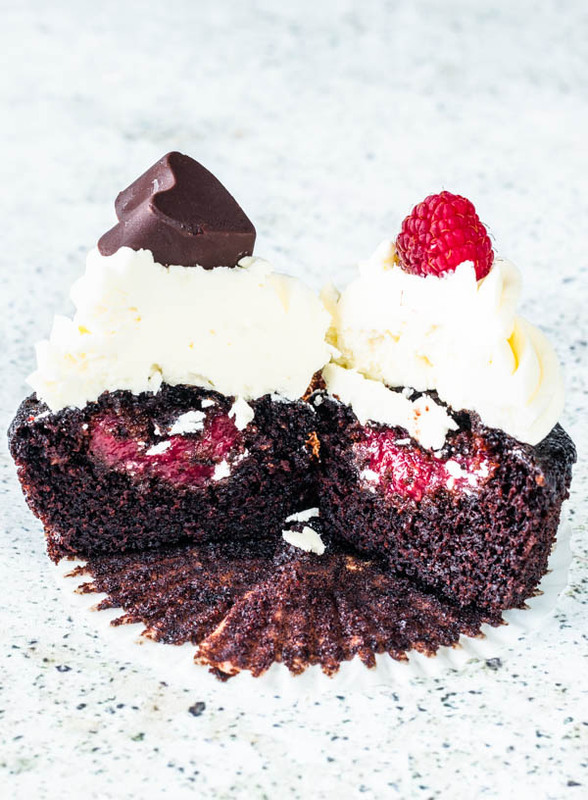 The rich chocolate and the frosting on top but then you get the surprise raspberry jam in the center – these cupcakes are a home run! Thanks Sharon, these were my favorite raspberry cupcakes ever! This is my kind of cupcake!! I could eat them all! Thank you. These were delicious raspberry cupcakes! Oh yes, I love all the chocolates and then paired with raspberries. These cupcakes look wonderful. These are not only easy to make but tasty and LOOK amazing!! Thank you for a great recipe! These cupcakes look so good! I love the play on white and dark chocolate together AND the raspberry fulling. Yum! Wows these cupcakes are lovely and I bet delicious too. That surprise when you bite and you find yummy raspberries is great too. Raspberries and chocolate are a heavenly combination. I love Rodelle products that basket looks tempting to participate in the giveaway. Thank you Adriana! The prizes are really awesome!! The timing of these is perfect! I just had an ice cream last night that was white and dark chocolate with raspberry swirls. I cannot stop thinking about it, so I think I’ll have to recreate that ice cream with these cupcakes instead!! White and dark chocolate is a combo that goes so well with raspberries! Thank you! I love raspberry and chocolate together! These cupcakes look so delicious! Wow! These cupcakes look so scrumptious! The raspberry jam filling sounds amazing. Love the heart chocolate decoration on top too. Thanks Marie, the raspberry jam filling was delicious!! Haha you cracked me up with the love drama! When in doubt, choose both lol. They look SO delicious and so cute! Thanks Kelly, your cupcakes were beautiful and so colorful!! Loved your sprinkles!! Girl just stop! These look amazing! Let’s be neighbors okay?! I want to make these right now they look so good!! Subscribe to receive e-mails when we post a new recipe! Help spread the word. You're awesome for doing it!